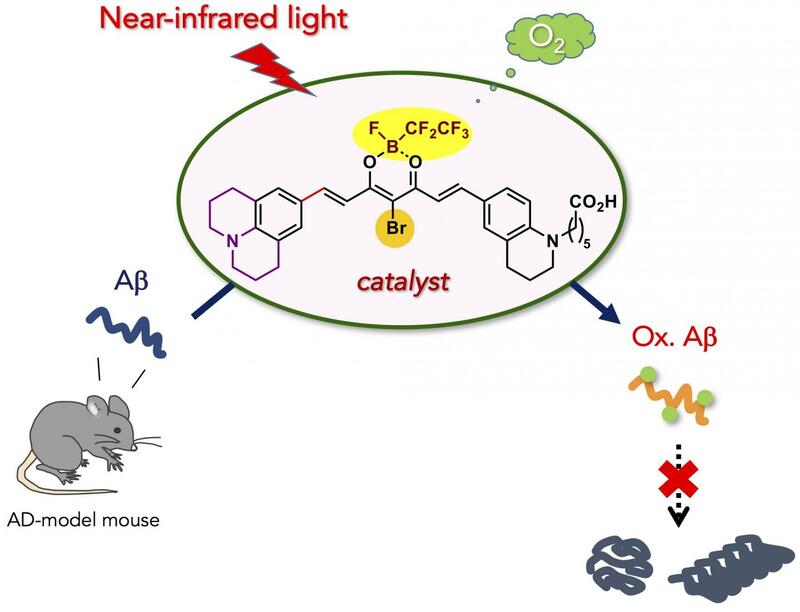 A new, biocompatible photooxygenation catalyst that can selectively oxygenate and degrade the pathogenic aggregation of Alzheimer's disease (AD)-related amyloid-β peptide (Aβ) under near-infrared (NIR) light irradiation is developed. The catalyst was able to oxygenate Aβ embedded under the skin of a living mouse, and diminished intact Aβ level in AD-model mouse brain. The new catalyst is potentially applicable for the treatment of peripheral amyloid diseases and AD. Toxic aggregation of amyloid peptide and protein is intimately related to a number of human diseases. Amyloid-β (Aβ) is a representative amyloid peptide whose aggregation is related to the pathogenesis of Alzheimer's disease (AD). The development of an artificial chemical system that selectively converts toxic amyloid aggregates to non-toxic species under physiologic conditions, thereby potentially suppressing the pathogenic process, could be a novel therapeutic strategy to treat currently-incurable amyloid diseases, including AD. We envisioned that photocatalyzed aerobic oxygenation would be a suitable chemical reaction to attenuate the pathogenic aggregative properties of Aβ under physiologic conditions. Because peptide and protein aggregation generally depends on intermolecular hydrophobic interactions, covalent installation of hydrophilic oxygen atoms to a peptide or protein (i.e., oxygenation) would decrease the aggregative property. We previously reported that aerobic oxygenation of Aβ proceeds in the presence of Flavin (vitamin B2)-based photocatalysts, and the resulting oxygenated Aβ exhibits very low aggregative ability and toxicity. Thereafter, more selective photooxygenation catalysts, activated only when sensing a toxic higher-order amyloid structure, were developed based on a fluorescence probe for aggregated amyloid peptide and protein. In vivo application of the catalysts was, however, unfeasible, because irradiation with visible light, which has low tissue penetration, was necessary for catalyst excitation. For in vivo application, photocatalysts must be able to function under excitation with longer wavelength light, referred to as the "optical window" in which living tissue absorbs relatively little light. Here, we developed biocompatible photooxygenation catalyst that can selectively oxygenate and degrade the pathogenic aggregation of Aβ under near-infrared (NIR) light irradiation. The catalyst exhibited four main advantages compared with the previous catalysts for degrading aggregated and toxic Aβ: (1) High selectivity for aggregated Aβ that stems from the higher-order amyloid structure-sensing on/off switch for the catalyst activity. The precise target selectivity allowed for photooxygenation of aggregated Aβ in the presence of the cells and in mouse brain lysate. (2) Low toxicity to the cells. Structural optimization of the catalyst markedly reduced the cytotoxicity, both in the dark and under NIR irradiation. (3) High oxygenation potency under NIR photoirradiation. Due to tissue-permeability of NIR light, photooxygenation of aggregated Aβ under the mouse skin was possible in high yield. (4) Applicability to the living animal brain in vivo. Injection of the catalyst to the AD-model mouse brain along with NIR light irradiation led to significant decrease of the intact Aβ level in the brain. The results obtained in this study are an important step to using artificial catalysis as a potential therapeutic strategy against amyloid diseases.